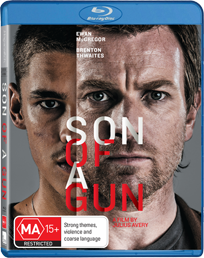 Win Son Of A Gun: Ewan McGregor & Brenton Thwaites' gritty Aussie crime thriller | SWITCH. 'Son Of A Gun' is a smart edge-of-your-seat heist thriller starring Ewan McGregor ('Trainspotting', 'The Impossible') and Brenton Thwaites ('The Giver', 'Maleficent'). Serving six months for a minor offence, 19-year-old JR (Thwaites) quickly learns the harsh realities of prison life. After a chance encounter, he finds himself under the watchful eye of the enigmatic Brendan Lynch (McGregor), a calculating crime boss with extensive connections both inside and out. In exchange for protection, JR becomes apprentice to Lynch, and upon release he must orchestrate Lynch’s daring prison escape. Rewarded for his involvement and with a taste for the high life, JR joins the crew on their next job – a high stakes heist that promises to deliver millions. Sucked deeper into the criminal underworld and unsure of whom to trust, JR soon finds himself on a collision course with his mentor in a very dangerous game. The assured debut feature of Australian director Julius Avery ('Jerrycan'), this taut psychological thriller, both artful and laced with action, palpably gets under your skin. The 'Son Of A Gun' competition has now closed. Winners will be announced shortly. Competition opens at 5pm AEDT on Sunday 1st February 2015 and closes at 11:59pm AEDT on Sunday 8th February 2015. Three winners will be chosen at random on Monday 9th February 2015. To successfully win, entrants must fulfil the above entry conditions before the time the competition closes. Current members/followers are eligible to enter the competition. Only one entry per person. Only one winner per household. To be a valid winner, the entrant must not have won a prize from SWITCH within the last 28 days. Each winner will receive one Blu-ray copy of 'Son Of A Gun'. By entering, you agree to receive occasional emails from SWITCH in the future. If you decide to unsubscribe from these updates, any further entries will not be applicable. Only Australian residents are eligible to enter. 'Son Of A Gun' is available on Blu-ray, Digital HD and DVD on Wednesday the 4th February 2015 from eOne.